Gold Creative Showcase Award at ACE 2015, Record, Play, Go… Cristina Sylla, Eva Oliveira Gonçalves, Joaquim Dantas, Vítor Carvalho, Pedro Branco, Iskandar, Malaysia, 12th International Conference Advances in Computer Entertainment. Golden Award for best demo at ACE 2014, Meet The Frumbles – A Post-Digital Toy Orchestra, Luis Fraga, António Coelho, Pedro Branco, Funchal, Madeira, 11th International Conference Advances in Computer Entertainment. World Technology Award 2013: entertainment , t-words, Cristina Sylla, Sérgio Gonçalves, Pedro Branco, Clara Coutinho. Best 'Work in Progress Paper' at Videojogos 2013 for "Playable and Collaborative Art: the MonMazes case-study", Ana Carina Figueiredo, Marco Heleno, Nelson Zagalo and Pedro Branco. Golden Award for best demo at ACE 2012, t-words, Cristina Sylla, Sérgio Gonçalves, Pedro Branco, Clara Coutinho, Kathmandu, Nepal, 9th International Conference Advances in Computer Entertainment. Awarded with Artistic Production Incentive at VIDA 13.0 TELEFONICA, AMONG (2010) by Sérgio Soares Ferreira. PREMIO Zon 2008, Finalist Diploma in Applications, YMYI - You move you interact (2008) by João Martinho Moura and Jorge Sousa. 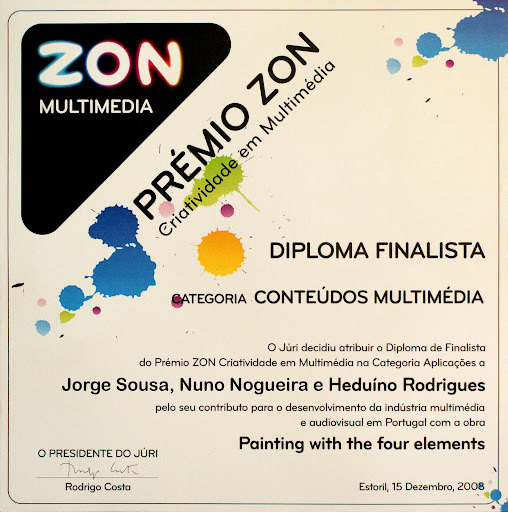 PREMIO Zon 2008, Finalist Diploma in Multimedia Content, PAINTING with the Four Elements (2008) by Jorge Sousa, Nuno Nogueira and Heduino Rodrigues. O princípio da criatividade, Diário Económico, 22.11.2013 (in Portuguese). Investigadores portugueses ganham World Technology Awards, Exame Informática, 20.11.2013 (in Portuguese). Winners of the 2013 World Technology Awards Announced, Individuals & companies recognized for innovations of "the Greatest Likely Long-term Significance." 18.11.2013.
engageLab: a oficina dos sonhos, revista SIM, 6.6.2013.